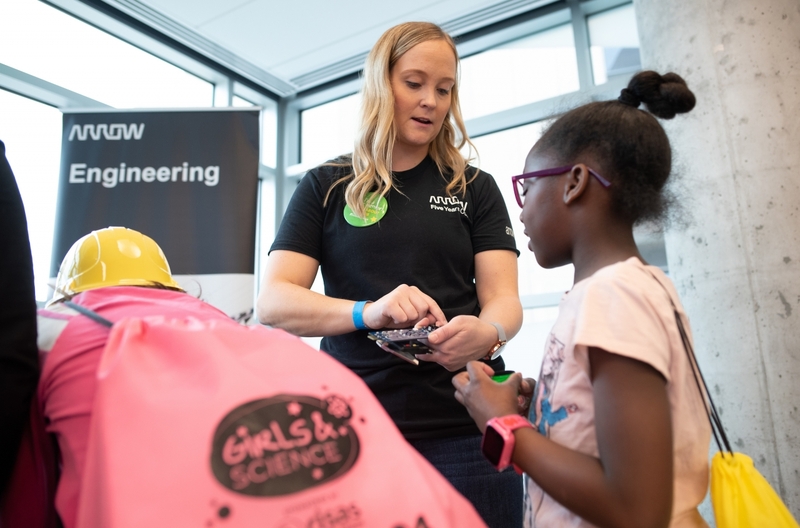 DENVER, March 25, 2019 /3BL Media/ – Earlier this month, Arrow Electronics engineers Grace Doepker and Maddie Eyolfson served as mentors at Girls and Science, an annual education event that inspires girls to pursue careers in STEAM (science, technology, engineering, the arts and math). Hosted by the Denver Museum of Nature and Science and KCNC-TV (CBS4 Denver), the event drew 7,400 attendees who participated in STEAM-related activities and heard presentations from women in STEAM careers. Doepker and Eyolfson gave presentations on their career paths and participated in one-on-one mentoring sessions throughout the day. “It was great to share my passion for engineering and show how a technical career can be both interesting and impactful,” said Doepker, an engineer on the Semi-Autonomous Mobility (SAM) Car race team and manager for the mechanical and industrial design team. Eyolfson, who works as an applications engineer at Arrow, talked about how she helps customers turn their ideas into manufacturable products. “I wanted attendees to know that women in the STEAM fields are on the front lines of driving innovation and solving problems,” said Eyolfson. Arrow also served as a sponsor of the all-day event, which is in its fifth year.